The following is basically a reply made to a post entitled Crucible Dividers on the Lost Art Press forums. Why waste a good bit of writing? EDIT: Lost Art Press discontinued their forums the day after this post. As far as I can tell the referenced thread was deleted before they archived the forum here. Start here to read about the acquisition of the Crucible dividers. I used my Crucible dividers last night in my design book to draft plans for an outdoor announcement board. I normally use a set of miniature dividers in my design book because the scale is tiny compared to real furniture. What follows is my initial impression after the first real use of the Crucible dividers. First off, when you close the legs together completely, they are closed tight. I guess this is a feature after reading a comment on the Lost Art Press forums. The only downside to the positive lock feature is that opening the dividers one handed from 'home position' is difficult. I never carry dividers around in a pocket, so they are rarely closed all the way in my practice. Once open, and the tension adjusted to your preference, the dividers are a joy to use. Trite, but true. For me, a 'joyful' use of something means it works without having to think too much about it. The heft of the Crucible divider is just right for my grip. Not too flimsy, nor too weighty; you will know reflexively when the weight is in your hand, or on the work. Using the dividers is free from obstruction or distraction. This deserves some explanation. I have a few dividers with the wing swinging off to one side. Flipping a wing divider to step out some measurement requires some fairly dexterous hand movements to account for the wing. In short, you have to think about moving them. I have another style of divider with the stem on top, like the grade school pencil compass. They have a lighter mass than the wing compass, and the stem is handy to hold on to when you flip them. However, the lower mass and round stem means that this style is almost always over rotated to the next step. At least for me. I'm sure stem compass experts will call me a dumbass and move on. The Crucible divider does not have a stem, nor a wing. 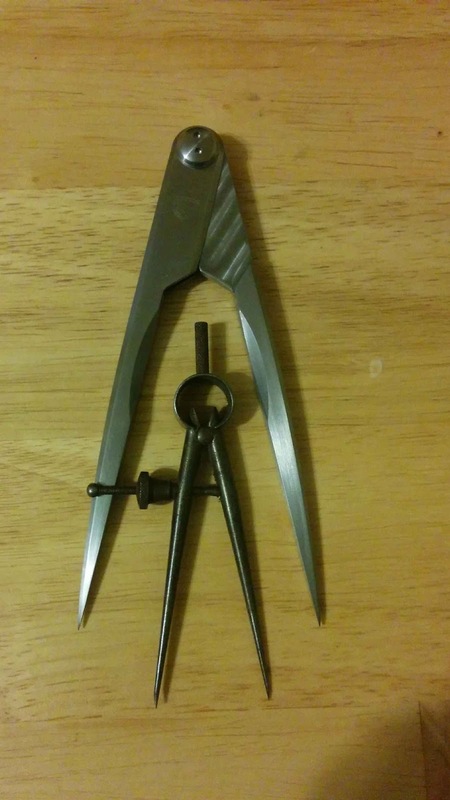 The top of the compass is almost too easy to flip end for end and land on a straight line. I had to teach myself to under think it. A simple flip with three fingers is all that is needed for precise placement of the compass; two fingers in a pinch (pun so intended). I believe with more practice only two fingers will be needed to effectively use this tool without thinking about it. So, now you know why I say the tool is easy to use without obstruction, or distraction. Now, for the downside. Precise setting of these dividers is a tad more difficult than I'm used to. I should note that I have the tension set fairly high on the tool because it is more important to me to keep the setting once arrived at than getting there to begin with. I inevitably need micro adjustments when dialing in on half of something. A wing compass with the micro adjust knob does a great job of this. I'm sure I'll figure out a process with the Crucible dividers before too long. Remember, this was written after one evening's use and I do not have any dividers of this style already. Compared to mega-store stamped steel crap, and the flush used market, the Crucible dividers are a pill to swallow at $120.00. For a high milling tolerance American made cottage tool, the price is a reasonable balance between Crucible keeping the lights on, and reaching as much of the wood working market as possible. In fact I'll buy another one if the tool works out as well as expected.